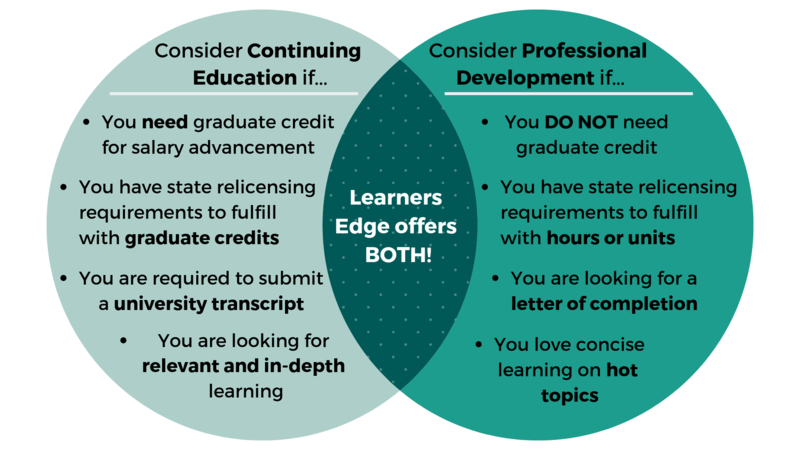 Below is a summary of how Learners Edge may help your continuing education and Utah educator license renewal needs. This summary should in no way release individuals from their responsibility of ensuring that the course they take meets their professional needs. We hope it provides assistance in understanding how Learners Edge might help you in the accumulation of clock hours or graduate credit for salary advancement and the Utah teaching relicensure process. See the Utah State Board of Education website for complete UT teacher relicensure information. A Level 1 license may be renewed if the individual has less than 3 years of experience in a Utah public or accredited private school and has earned 100 points within this cycle or the most recent 3 years if the cycle has expired. All Level 2/3 license renewals require prior review and approval of 200 points completed after the issue date of this cycle or 5 years of the date of renewal if the license has expired. Youth Suicide Prevention: Active Educators are required by state law (53A-1-603) to have at least 2 hours (points) of professional learning on youth suicide prevention within their license cycle to renew their license. shall be successfully completed with a C or better, or a pass. Each semester hour, as recorded on an official transcript, equals 18 license renewal points. Only non-remedial (course number > 1000) coursework at regionally-accredited universities may be counted for renewal points.